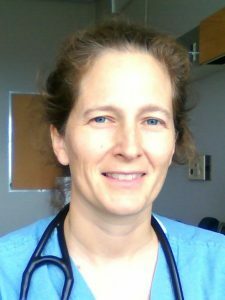 Alexandra Binnie is a critical care physician at William Osler Health System in Toronto, Ontario where she is also the physician lead for research. She completed her doctorate in molecular biology at Oxford University and her medical degree at Harvard Medical School and then trained in internal medicine and intensive care medicine at the University of Toronto. She currently divides her time between Toronto and Portugal, where she is an Invited Assistant Professor and intensivist at the Centro Hospitalar Universitário do Algarve. She is interested in the pathophysiology of sepsis and multi organ dysfunction syndrome, with a specific focus on the role of epigenetics in driving gene expression change.